PhotoxAir™ is an indoor air purification system that significantly reduces harmful airborne microorganisms and indoor air pollutants. We believe that our customers benefit from air that is continually being treated to destroy dangerous pathogens, chemicals and odors so we’ve designed three ways for you to benefit from cleaner air. If you are interested in any one of these programs, please contact us for more information. Our affordable, worry-free service program for the treatment of indoor air. This program is designed to provide continuous treatment of indoor air without the worry of upgrades, cleaning or maintaining your mobile air purification system –we’ll take care of it for you. 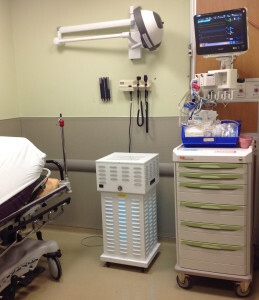 The PhotoxAir mobile air purification system unit will be monitored quarterly. The customer service team will clean or replace the catalyst media or lamp as needed; typically once every twelve months. The customer will always have a working machine. Call customer service to report any problems and repair or replacement of unit will be initiated within 48 hours. Upgrades at no charge. PhotoxAir will upgrade the customer’s unit with latest improvements as part of the annual service call. A cost effective monthly recurring service contract price to be derived from the monthly operating budget, instead of an up-front and potentially unaffordable capital expenditure. Apply for up to a 60 month term to purchase your PhotoxAir mobile air purifier(s). Pricing includes a service package for scheduled maintenance of your purification system. To insure the efficacy of your PhotoxAir mobile air purifier, we recommend scheduled maintenance. If properly maintained, PhotoxAir technology removes viruses, bacteria, mold spores, VOC’s and odors from indoor air –destroying, not trapping unwanted contaminants. Service Packages are priced as part of the Lease to Own program. Contact us to learn more and get a list of providers in your area. PhotoxAir™ is an indoor air purification system that significantly reduces harmful airborne microorganisms and indoor air pollutants. Our innovative, patented system is designed to make an important contribution to the reduction of airborne contaminants in hospitals, physician offices, schools, nursing homes and day care centers. PhotoxAir™ Technology has been lab tested and clinically proven to effectively reduce airborne viruses, bacteria, fungi, spores and unwanted or harmful odors. On March 28, 2013 the Public Health Agency of Canada (PHAC) released an extensive laboratory report concluding that the PhotoxAir technology (marketed under the LeVOCC brand within Canada) successfully removed a broad panel of airborne microorganisms, spores, vegetative bacteria and negative stranded viruses. Post testing of the test chamber by PHAC revealed that no test organism or genetic material of the test organism survived. The content of our air effects our daily health and overall well-being. Unfortunately, airborne contaminants are inescapable, but they are not untreatable. PhotoxAir devices destroy airborne contaminants and we believe the difference is noticeable. If you are interested in cleaner air for your indoor environments, visit our Contact Us page or the Purchase Programs page.